Working in a garden is not possible without any tools at hand. It requires a lot of tasks and having the right tools will make your garden maintenance plain sailing. Since there are a lot of gardening tools available, you might be confused which ones are essential or not. A huge part of gardening maintenance involves cutting and trimming small trees, bushes, and other perennials. Hand pruners and loppers are essential for these tasks. Pruners can be used for cutting stems and branches with a small diameter. Loppers are intended for larger branches. These tools can be used for deadheading or regular trimming activities. Pruning your bushes regularly will initiate healthy plant growth and will make it grow to your desired shape. Cutting tools is also essential during harvesting season if you grow fruit trees and vegetables in your garden. Grasses usually grow fast, most especially during the rainy season. Proper maintenance of your lawn is essential in every well-maintained garden. You can avoid it being bushy by investing in a lawnmower. Getting an affordable lawnmower is enough for your garden maintenance needs. Usually, these are the convenient types where you can easily use and store the equipment. Water is essential in every gardening activity. Garden hose can facilitate, bringing the water supply to any area of your garden which makes it easier for you. However, having a water sprinkler is good when you are working in planters, plant boxes and flower pots with delicate herbs and flowers. Having a wheelbarrow in your garden will make it easier for you, especially if you do not have anyone to help you out. Garden maintenance also involves moving and lifting objects such as garden soil, fertilizers, and pots. Investing a wheelbarrow will help you accomplish these tasks in a breeze. Shovels and spades are useful when digging soil, edging and even moving mud and large debris in your garden. Investing in a good one with high-quality material will provide better garden maintenance. Make sure that you get it with a handle that is comfortable on your hands and has a length that will provide good leverage. Another garden essential is a hand trowel where you can use for various purposes such as transplanting seedlings in pots or trays, distributing soil in pots and getting fertilizer in sacks. Having a well-made trowel will make your garden maintenance a stroll in the park. 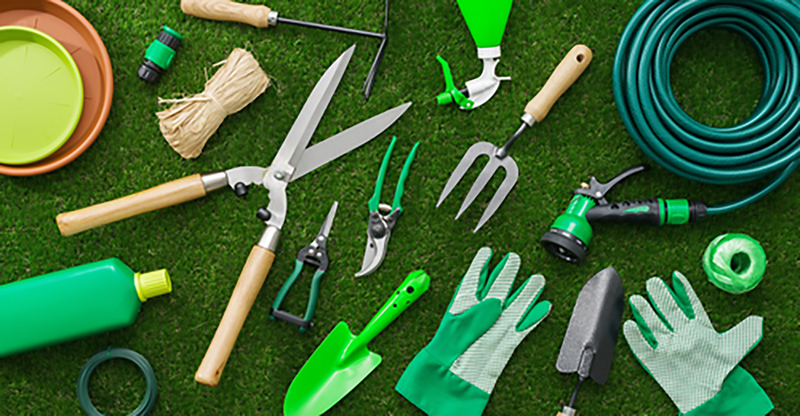 Now that you know the essential tools needed to have a well-maintained garden, it’s now time to buy and gather them in stores. By investing in the right tools, you will avoid overcrowding your garden shed, and at the same time you can accomplish your gardening tasks in no time.